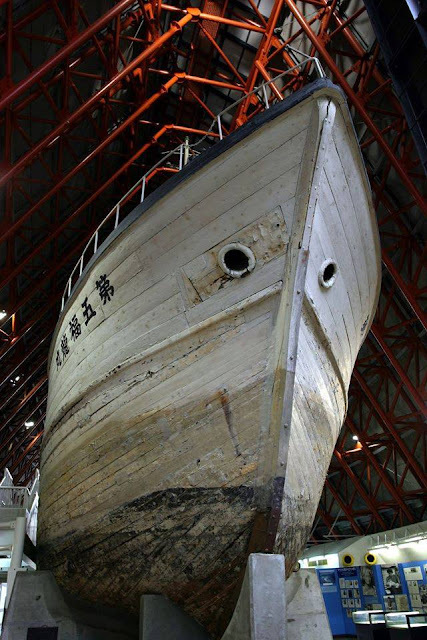 PennsylvAsia: Japanese speakers (and students of Japanese) wanted for recordings for local documentary on Daigo Fukuryū Maru, November 28. Japanese speakers (and students of Japanese) wanted for recordings for local documentary on Daigo Fukuryū Maru, November 28. The boat on display in Tokyo, via Daigo Fukuryuu Maru Exibition Hall. A local filmmaker is looking for Japanese speakers (native and non-native alike) to record a few lines for an upcoming documentary on Daigo Fukuryū Maru, a Japanese tuna fishing boat that was contaminated as a result of an American nuclear weapons test in 1954. We need a dozen or more Japanese speaking students (native and non-native alike) to meet in a classroom and record audio for some crowd scenes in an upcoming film. You can see your name in the credits on the silver screen if you sign in. Show up at 1:00pm. Practice a few lines of Japanese with cue cards until everyone is confident. Follow director suggestions. Record. Done! Local documentary filmmaker, Keith Reimink, is working on a Japanese language documentary about Daigo Fukuryu Maru, or The Lucky Dragon No 5. On March 1st, 1954, the 23 crewmen aboard the Japanese tuna trawler were fishing near the Marshall Islands when they witnessed an explosion. The flash turned into a mushroom cloud and eventually rained down a mysterious ash, which came to be called "shi no hai" (ashes of death). The fishermen had just witnessed Castle Bravo, the first in a series of hydrogen bomb tests conducted by the Americans. During their two week journey back to Yaizu, Japan, the crew began to suffer symptoms of radiation sickness. Upon return they were immediately sent to Tokyo and hospitalized for over a year. They were subjected to invasive tests, persistent questions from journalists, and were unwittingly thrust into the middle of an international incident. Six months into their hospital stay, their colleague and friend, Aikichi Kuboyama, died from his exposure to radiation. Kuboyama-san became the first man to die from exposure from a nuclear test during peace time. Keith is working with local artists and organizations, as well as artists across the country and in Japan, to tell this story. His documentary has been awarded a Creative Development Grant from The Pittsburgh Foundation, and will be submitted to festivals around the world. This documentary is important because it tells a story that involves both Japanese and American interests, and the story is in danger of passing away with the aging fishermen.